This week’s open call: I submitted work to the General Open Call of the No Man’s Art Gallery. Whenever I failed to provide a letter of recommendation to authorities in the art world, I felt inadequate, even ashamed. I have been experiencing this as a failing, a black whole in my practice. Could it be that I should be wearing this inadequacy proudly instead? In the article The Death of Mentors I explain that it is not the death of the Mentor per se I am proclaiming, but rather the gradual extinction of a particular kind of mentor, one that used to be taken for granted in the course of an artist’s development, and that was for the him/her (but usually him) an invaluable Guide into Art. This Mentor was generally to be found in institutions the aspiring artist would turn to in order to learn his trade (the fact that once art began to no longer be considered a trade, the mentors became scarce calls for closer inspection). As I go on to say in that same article I myself in fact do know what a real mentor in the broader sense is because I had the fortune to meet one in the person of my father. That in turn goes to say you shouldn’t take the term “fatherless child” literally either: Fatherless here means with no mentor in one’s trade. But what does that mean exactly? There are books (nowadays there is also the internet) and there is the history of art, accessible now more than ever. Furthermore, if we agree that a mentor is essentially a guide and a mystagogue in one’s art, it is no secret that artists could always choose their mentors among the legions of the dead. 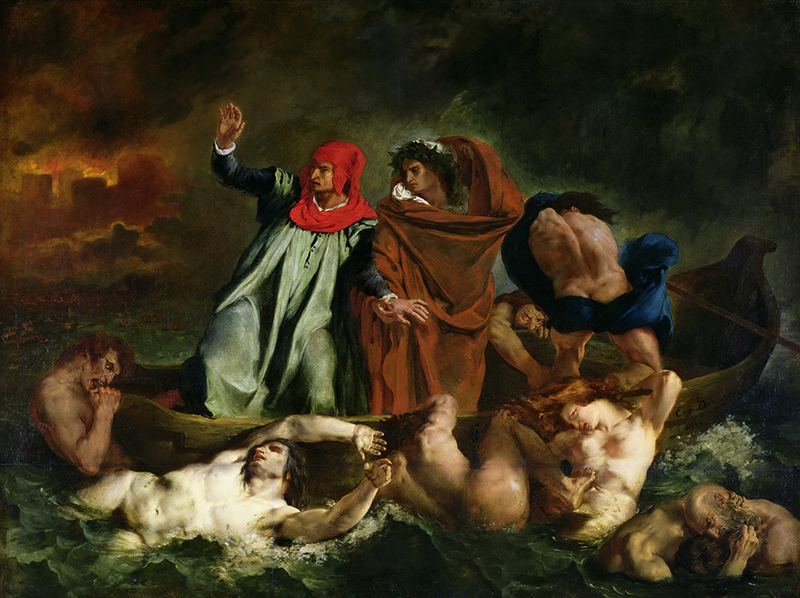 Dante never met Virgil in person, in fact the latter lived over 1000 years before him, nevertheless, in Dante’s Divine Comedy, the ancient Roman poet is awarded the role of the young poet’s guide across the dark waters of Art and life. Dante’s infernal journey that ended with his triumphant vision of God is one in which Virgil as his guide helped him take. Not having a real life mentor doesn’t mean that you are left with no guidance in your quest to meet your vision in art and life. Given this, one might ask, why is being a fatherless child even an issue? Having no guidance seems to have never really been an inescapable situation (except for extreme cases defined by much serious problems than not having a mentor), but rather one that an artist might find him/herself in voluntarily (although, everyone, whether they choose to admit it or not had at some point some spiritual guidance). Maybe I should add something to my previous definition: A fatherless child has no real life mentor to guide or protect him/her. The mentor here needs to be among the living and therefore be able to protect in a certain way. In Canto XIII of Divine Comedy when the young poet and his Master are about to enter Hell’s eighth circle they are stopped by “more than a thousand” that inquire who might this man be daring to enter the gates into the regions of the dead “without death first felt”. Virgil is urged to enter alone and leave Dante behind to return on his own “by his witless way”. Desert me not,” I cried, “in this extreme. Together trace we back our steps with speed. I will not leave thee in this lower world. Dante’s guide was able to protect him. Nevertheless, he wasn’t alive. Actually the fact that he was among the dead made it possible for him to guide him in this infernal journey. Things in today’s art world are rather measured by different standards. The divine guidance of the dead may at times not make the cut. In order for one to not become disheartened or loose faith in one’s art, he/she should be able to discern when they are being judged for their work and when for something entirely different. And to know that being a fatherless child can be enough for the gates to remain shut: Because, getting closer to a more complete definition, being a fatherless child in art today means starting out with no real life mentors (not the kind that officially counts anyway) to protect you in the face of the gatekeepers. Taking all the possible forms of authority, from artist residency directors to grant awarding committees, to heads of post graduate studies departments, they, never mind their proclamations of nothing being more important than your work itself, request, or rather require that you do nevertheless have a protector, a real life one, that is ready to vouch for you (usually in the form of a letter of recommendation) if you are ever to be let in through those gates. As I mentioned in the beginning, whenever faced with a gatekeeper’s request that I was not able – or not willing – to satisfy, I felt inadequate. At some point this question set in: What if not having protectors was to a degree the inevitable outcome of my actions? And what if it had been who I was ultimately that had led to my present “predicament”? To the degree that I still recognized myself gladly in the actions and choices that made me who I was, could it be that my predicament was just how things were meant to be? This realization, one that can be considered as a kind of realization of the self, made the regret, the shame, the feeling of inadequacy to seize to have any power over me. This inadequacy was part of me, and one that was welcome, since it came as a result of a series of choices I recognized myself in. Still, somehow I wasn’t good enough for the gatekeepers. Could my inadequacy be just a reflection of the gatekeepers’ own failings? How one ends up being a fatherless child in art anyway? For one, there is the death of mentors, then there is the element of chance (not everyone is fortunate enough to have real life guidance in art), and ultimately, leaving out the case of one not being worthy enough to be awarded a guide, there is the kind, not so rare in the ranks of the artists, that doesn’t make friends with flattery, nor so much with authority. And the sad truth is that most “mentors” today, require something in return. That something not being solely respect or gratitude but rather an acknowledgment of their complete authority, that is, the student’s humiliation. Gatekeepers were always used by authority to control behavior. By rewarding a certain kind and punishing another they participated in the kind of social engineering we are familiar with since our childhood. Some of the brightest kids I met when teaching art in public schools were also the ones being “punished”, either by low grades, or by actual means of punishment by the school’s “gatekeepers”, the teachers. These kids were guilty of being too free in the face of authority. So even though the gatekeepers may be wrong in demanding that a young artist provides them with proof of an authority figure’s support, they are also right: One must expect this from the gatekeepers, at least on occasion, and not be surprised when allegiance to authority is considered a requirement. So let the gatekeepers do their job while we entertain this thought: If Dante felt in any way obliged to meet such demands in order to enter the infernal gates would he ever reach the vision that awaited him at the end of his journey? Maybe the gatekeepers of the art world aren’t always the ones we should keep our sights on. Were you ever discouraged by a gatekeeper’s demands you weren’t able to meet? Did you ever feel that the standards by which you were judged as an artist were not the ones they should be? How did you overcome this obstacle, and if it is one you are still facing have you changed the way you view it over time? The excerpts from Dante’s Divine Comedy, Canto VIII, are translated by the Rev. H. F. Cary, M.A.